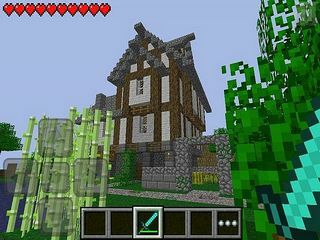 Minecraft - Pocket Edition is a game that had high sales for PC made available for your device. Some are probably well familiar and know what to expect, others might have totally missed this game. This version does not offer all you know from the PC version of it. This Poket Edition does lack some other elements that you can run into or use in the PC version, like enemies or animals. This game is about exploring and building in your own world. You are provided with wide range of materials (blocks of lush, glass, wood etc...). You can let your fantasy go wild and build or dig as you desire. The look of the game hasn't change really. To be honest, it does look "blockish" and plain. The colors are all earthy - green, brown, grey, blue. It is not visually oriented. But this is what it looked like for years and it is part of the brand now. This Poket Edition does lack some other elements that you can run into or use in the PC version, like enemies or animals. But it is probabaly be expanded later. Another limitation is space. You can not just wonder around for hours without reaching a wall because of a memory limit. The game has really become more convenient to have with you and play whenever you want. You can also play with your friends if there's wi-fi access. This release might be a slight disappointment for those familiar with the game. But the first-timers might actually enjoy it. 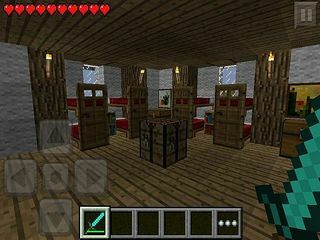 This is Minecraft - Pocket Edition review. Download this game here.